Home > Used Vehicles > 2017 Chrysler Pacifica Touring-L Plus,LEATHER,SUNROOF,NAVIGATION,DVD PLAYER,DUAL POWER SLIDING DOORS, TOO MANY FEATURES TO LIST!!!! 2017 Chrysler Pacifica Touring-L Plus,LEATHER,SUNROOF,NAVIGATION,DVD PLAYER,DUAL POWER SLIDING DOORS, TOO MANY FEATURES TO LIST!!!! On sale now! This vehicle was originally listed at $38900. We've marked it down to $35990. You save $2910. 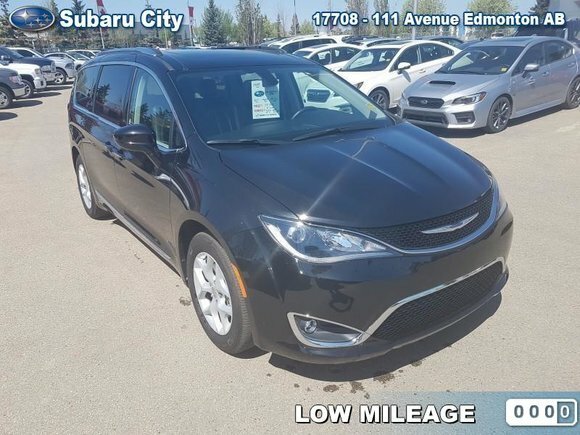 This 2017 Chrysler Pacifica is for sale today in Edmonton. This Chrysler Pacifica stands for family pride as much as your home while it raises the neighborhood bar. This all-new ultimate family vehicle displays a sleek, athletic stance with a sculpted body. This minivan is safe, quiet, and extremely well appointed with useful features. It's easy to see this Chrysler Pacifica was designed with families in mind. This low mileage van has just 15971 kms. It's brilliant black crystal pearl in colour and is completely accident free based on the CarProof Report. It has an automatic transmission and is powered by a 3.6L V6 24V MPFI DOHC engine. This vehicle has been upgraded with the following features: Leather Seats, Heated Steering Wheel, Rear View Camera, Remote Start, Bluetooth. It has some remaining factory warranty for added peace of mind. To view the original window sticker for this vehicle view this http://www.chrysler.com/hostd/windowsticker/getWindowStickerPdf.do?vin=2C4RC1EG1HR733623. Buy this vehicle now for the lowest bi-weekly payment of $234.02 with $3862 down for 84 months @ 5.99% APR O.A.C. ( taxes included, $790 Administration and Secure Ride included / Total cost of borrowing $7834 ). See dealer for details. Want to try the 2017 Chrysler Pacifica Touring-L Plus?